Our Community founder and group managing director Denis Moriarty says Our Community's organisational and workplace culture was developed "organically, but with clear purpose". That culture drives Our Community's 10 main enterprises, including the Institute of Community Directors Australia (ICDA). That culture is perhaps best distilled in the social enterprise's "Manifesto", a statement of intent about how it wants to get things done. Denis Moriarty says maintaining the organisational culture at Our Community takes continuous work, and reminders, such as the "Manifesto" which holds pride of place in the office. It sums up "what we believe", "what we do", "how we work" and "our ideal environment". The statement takes pride of place at the entry points to meeting rooms and - perhaps more importantly - on the kitchen wall. "We just asked all our staff to contribute to what they thought we were all about. There wasn't any long-winded process, but we've been happy with the results," Mr Moriarty says. "We want our staff and all of our many visitors to be reminded about what we believe in as soon as they walk in the door. "We don't mind that it sounds radical - we are striving for revolution, after all. And if it grabs people's attention, I figure that's a good thing. We want to make our mark." 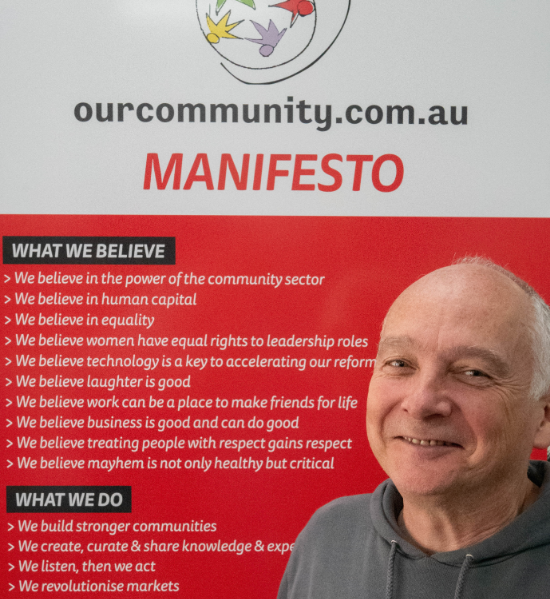 The Manifesto comprises 28 statements, spelling out Our Community's stance on many issues, including community, equality, respect, creativity and social responsibility. People often comment on this one: "We value our flat structure: we share the cleaning as well as the decision-making." And yes, Denis Moriarty does do his share of cleaning the toilets. It's that kind of culture. Of course, Our Community's cultural values are spelt out through every channel it's got, including media statements, research reports, books, online help sheets, videos and social media. It has a stated pledge to members and customers, for instance, and the basic premise is to treat others "as decent human beings". Our Community's certification as a B-Corp is an acknowledgement of its status as a self-sustaining yet socially minded enterprise. But it takes more than great-sounding credos. Mr Moriarty reiterates that a healthy culture requires hard work and buy-in from everyone in the organisation. "Part of committing to this kind of culture also means being prepared to cut ties with people or organisations who clash with our beliefs. It is, of course, much better to ensure you don't forge those kinds of relationships in the first place, which is why we recruit and build partnerships so carefully." VIDEO: Meet some of the Our Community crew explaining what being a B-Corp is all about.